Xi Riverview Palace apartment for rent in District 2 HCMC is located in Thao Dien Ward, just 6km from the City center and 1km from Hanoi Highway. A very nice location in HCMC. Nestled among luxury villas and international schools are one of the best neighborhoods of the city. Thao Dien, Xi Riverview Palace offers the supreme design with panoramic views of Saigon River for an extra intelligent life to you. Less prosperous agricultural workers of District 2 have been forced to move in slum clearance measures. Thatched houses will be replaced by multi-story house and villas. A few single-family homes will be constructed for those with large incomes. A large number of citizens would go on living in high-grade apartment blocks. Each block contains swimming pools, tennis courts, shopping malls, and other necessary services. There will be kindergartens, elementary schools, and high schools, but there will be the university as all the universities are being moved to Thu Duc district to form the University Village, which is another plan of the city government. Besides the residential area will be the economic and trade zone with modern skyscrapers. This area is also populated by a portion of Ho Chi Minh City's expatriate community, and as such has a large number of restaurants, bars, and shops selling European foods, particularly the high street Xuan Thuy. XI Riverview Palace apartment for rent focused in design contours, surface buildings suitable for the surrounding natural environment. The building is designed in harmony with nature both Soundproofing competent in the apartment next door. 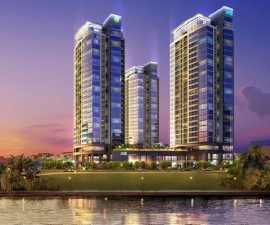 Land area is 17,209 sqm, with 27 floors, 3 building, 9 elevators (3 elevators per building). The parking lot can take up to 278 cars + 540 motorcycles (each apartment has one room to the car + 2 motorcycles). Xi Riverview Palace Apartment For Rent In District 2 HCMC has Gym, yoga, sauna, library, indoor golf course, restaurant, children's play area, swimming pool, guest house, tennis courts. Besides that there is Home network: Connect to the mobile network or computer, Management control systems and light gas digitally, Master key - master key systems: both are key entrances, both as tools to find the parking position, just as emergency alarms in the parking lot. Synthetic Security Management Center through BNS. The anti-theft device of inter-connected safe with the guard (for apartment 185.97m2 and 201.56m2). Anti-theft security system 4 classes. Doorbell camera with color display. The lobby and drop off area are equipped like5-star hotel.